I have chowder and chili on my menu this week. A sure sign of cooler temps and rain. I love a pot of something to serve on days like this. Rain, rain and more rain seems to be the theme for our weather this coming week. Today I'll be home and busy doing house work and some cooking while listening to all the rain falling. Tonight I have planned beef burritos. I'll be using THIS recipe. I'll cook the roast in my IP. I'll also make my own enchilada sauce as I can't seem to find a brand that I like. If you have a brand of enchilada sauce that you like, let me know. :) I'm going to make refried beans, rice and a salad to go with this meal. It probably is easier to make lasagna in the oven, but I want to try it out in the Instant Pot to see what I think. The sides will be butternut squash, green beans and french bread. You can find the recipe I'll be trying HERE. I've made acorn squash in my Instant Pot several times now. It is sooo good and so easy. Hope you have a chance to try some yummy winter squash! After a busy weekend communicating with my kids, which I love.... On Monday hubby and I headed over to our daughter Hannah's house. It was her birthday. I gave her a FitBit for her birthday gift. I knew she had wanted one. It will be fun to see if she gets as hooked by hers as I am about mine. I'm a little slow going on the fall cleaning. I've made some baby steps.... my laundry room/pantry/mud room is all cleaned and reorganized!! Clean my fridge. Another fall project. It needs to be done and I'm thinking I've procrastinated on this project for more time then it will actually take me to do.. ha, ha.. This time of year always seems to make me want to pull out my sewing machine and make something. I have a few things floating around in my head that I'd like to make soon. A common step in sewing is gathering fabric. Thanks to a good friend of mine I learned how to do this very easily several years ago. I thought I'd post this tutorial for anyone out there who may be doing a little fall sewing. Maybe it will help! The traditional method of gathering fabric has you sew a large strait basting stitch across the fabric and then pull the bobbin side to gather in the fabric. What would always happen to me is the bobbin threads would break or the task was just painfully time consuming. I had a nice weekend. On Saturday my son Jacob came up for a visit and spent several hours here. We had such a nice chat. He visits regularly and I always look forward to the visits. Over the weekend I also had a long phone chat from my daughter Emily. She is the daughter that lives in California. Her due date is fast approaching and we are all excited. She has approximately 4 weeks left. My goal is to be down there with her for the birth. We are praying for God's best timing on it all. It is a 2 ½ hour flight or a 12 hour drive. We'll see what the best option is when the time comes. My hubby is also taking time off work and we will be staying and helping out for a week or so after baby arrives. It has been a while since I've had a new ebook and I'm excited to share this one with you. 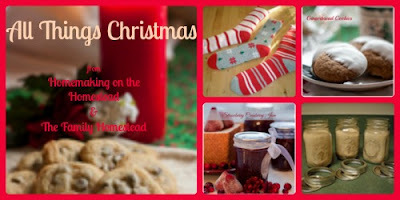 This 27 page ebook is a compilation of my favorite Christmas baking recipes, homemade gifts, and lots of homemade gift ideas. It's not too early to begin thinking about Christmas! The ebook is an automatic download. You will receive an email with a download link after you order. It was a wild wet week here in the PNW. We were feeling the tail end/remnants of typhoon Songa and it did a lot of damage to the coast and inland. Two tornado's touched down in two different coastal towns, which is very rare here in this part of the world. Thankfully we are far enough away that we only received a lot of wind and rain, but no serious damage. It sure is feeling more and more like fall! Fall tells me that the holiday season is just around the corner and I'm thinking about Christmas already as my list is pretty long with 8 children, their spouses, girlfriends/boyfriends and a whole lot of grandchildren! I do enjoy this time of year and find planning and preparing makes the best holiday times. This week I'm going to take some time to sit down and write out my plan for gifts, food to make, and all other holiday organizing. If you're looking for a simple sewing project that will add some nice decoration to your home, this easy table runner may be the project for you! What I really love about it is that it can be done so quickly and the end result can add a lot to your home. It requires only 2 pieces of fabric, a ½ yard and a 1/3 yard.. that is it. If you sew regularly you may even have that already in your fabric stash. What I like is that you can make several of them for the different seasons or holidays. Sometimes, even though you've been doing the same thing for years and years you come across a different, perhaps better way of doing it. That is a hack, “a not so common solution to something”. And more specifically I've stumbled across a method of folding laundry that I really like and is different then the way I have been doing it. Maybe I'm just slow to come around to things like this. After posting this, I'll probably hear from ladies that have been doing it like this or similarly for years.. ha, ha.. :) But I just had to share as lately I've been on a laundry theme. I was reading through a recent Reader's Digest and came across this article: http://www.rd.com/home/cleaning-organizing/marie-kondo-folding/ I was not really thinking I would try it, but did find it interesting. After cleaning out my summer clothes and reorganizing my drawers I decided to give it a try. How was your week? Are you ready to tackle another week? Lots on my to do list this week but I am ready. My menu is set and meals one less thing I have to think about. Today is a appointment and grocery shopping in town. I may be home a little on the later side so I'm contemplating picking up a pizza from Costco. I know my family won't mind my choice! :) I'll grab a salad in a bag from the grocery store to make this a super simple night. I found some petite sirloin steaks on sale last week and picked up a package. It is to yucky out to think about a bbq so I'm going to do a quickly pan fry these little steaks. I also bought a couple acorn squashes. I'm going to try doing those in the Instant Pot. I'll serve some biscuits along with this meal. We meet many people in our life. Some just pass through, some become friends and then we lose touch as life moves forward and some become true friends. Those women that are like sisters to us. The ones that we share our ups and downs and share our hearts with. The ones that love us, hold us close to their hearts as you hold them close to yours. Usually in life we don't have a lot of those trusted friends and the ones we do have hold a special place in our heart and lives. A few blog posts back I mentioned laundry. I asked if laundry was a job you liked, disliked, or loved. I've never been a big fan of laundry. Maybe because over the years raising 8 children we had a LOT of laundry. It was a daily constant chore. As someone who had many children said long ago, if the washer and dryer are not running, we are in trouble. :) And that was so true. When the children were at home it was all about the system of laundry. Everyone old enough did their own laundry. Each child had their own laundry basket, each child had their own color of towel and washcloth (which they hung on a hook after use and washed with their laundry). And each child did their own laundry once a week. There was still general/family laundry to do such as kitchen towels, cleaning rags and such and my and hubby's laundry. So to me laundry was a home management task, not something I took time to enjoy. What a week I had last week! Sooo much fun with my friend who was here visiting. Lots of fun and little time to blog. I'll be sharing all about our visit later this week. For now, it's back at it here at home. I have a full to do list planned for the upcoming week and my menu all written out so I don't have to spend a lot of time thinking about food and cooking. Here's what my week is looking like.. I had this on my menu not long ago and never did get it made. I plan on making this today in my Instant Pot using THIS recipe. I'll serve mashed potatoes with this and turn the juices from the roast into gravy. Not sure what veggie I'll serve. Most likely green beans and carrots.